You are currently browsing articles tagged Self-denial. Carrying our cross, following after Jesus to the “ends of the earth.” that is the stuff of sermons, the call that fills the altars, the great work that we feel that we must do, but washing the dishes, setting up chairs, sitting and listening to that person we know will carry on about their difficulties, that is that slow death that we wish to avoid. And yet, if we are to embrace the Disciplines and their work in us , shouldn’t we seek after those deaths, knowing that it will prepare us for that great work that we feel we have been called to accomplish? Perhaps a change in perspective is what we need. Caedmon’s Call recorded a song some time ago called “Sacred“. It’s a song of a mom asking the question “Could it be that everything is sacred?” as she serves her small children. The chorus ends, “Could it be that everything is sacred, and all this time, everything I’ve dreamed of (that calling, that great work), that has been right before my eyes?” Service, then, may not the distraction from the work that we are called to do but the way to step into it. What are the areas that you feel have been pulling you from your “calling” today? Household chores undone, a child’s homework, a dirty diaper, a friend’s telephone call? Perhaps it’s not a distraction but an opportunity. Why not try to embrace that moment of service, understanding that if we are to be great we must first become a servant (Matt 20:25-28). If you can, share about the experience. 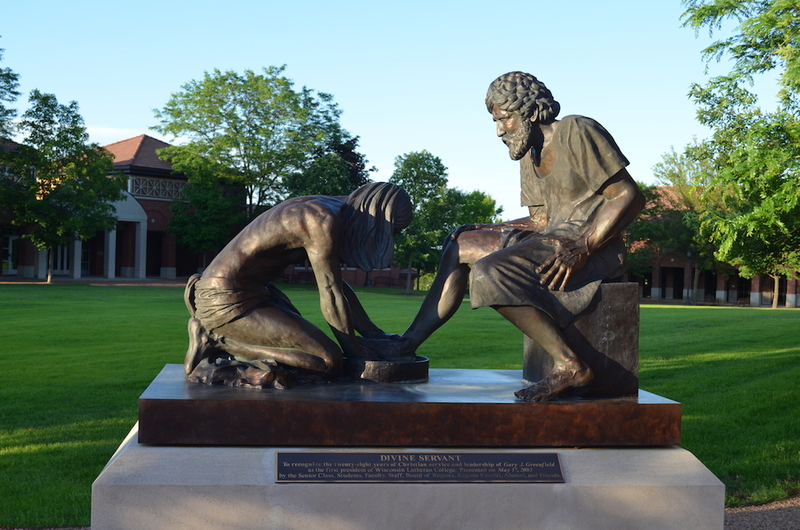 Image credits: Jesus washing feet statue WLC by txnetstars, used in accordance with a Creative Commons license.